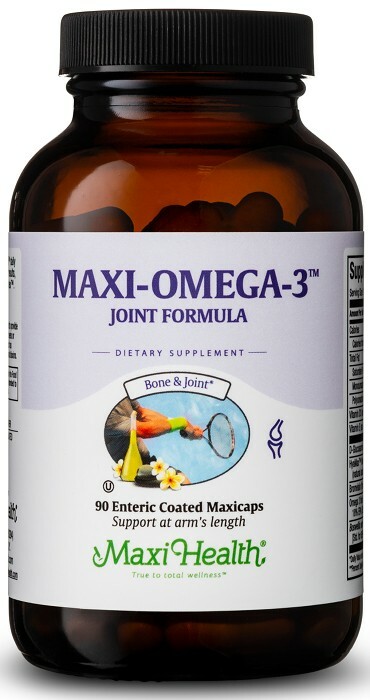 More than just Omega 3 fish oil, Maxi Omega™ Joint Formula was made with you in mind. Fish Oil contains Omega 3 fatty acids that support mobility and anti inflammation. Hyamax (natural hyaluronic acid) supports the production of synovial fluid in joint cavities. Taking supplemental hyaluronic acid causes the body to produce even more hyaluronic acid. Glucosamine sulfate supports bone and cartilage nutrition. Bromelain is an enzyme derived from pineapple, which reduces supports swelling, pain and healing. Boswellia is the purified gum made from the resin of the boswellia tree which supports anti-inflammation. For the active life you need to lead try Maxi Omega-3 Joint Formula™! Take two (2) Maxicaps™ daily with meals or as directed. For best results, take with Super Glucosamine Complex™. Other Ingredients: Vegetable cellulose, maltodextrin, titanium dioxide, mixed tocopherols, acacia gum, and enteric coating. Contains kosher fish (Menhaden, Anchovy) and soy. This product contains no wheat, sugar, salt, yeast, gluten, milk, artificial flavors, colorings or preservatives. HyaMax® is a registered trademark of Fenchem Enterprises.